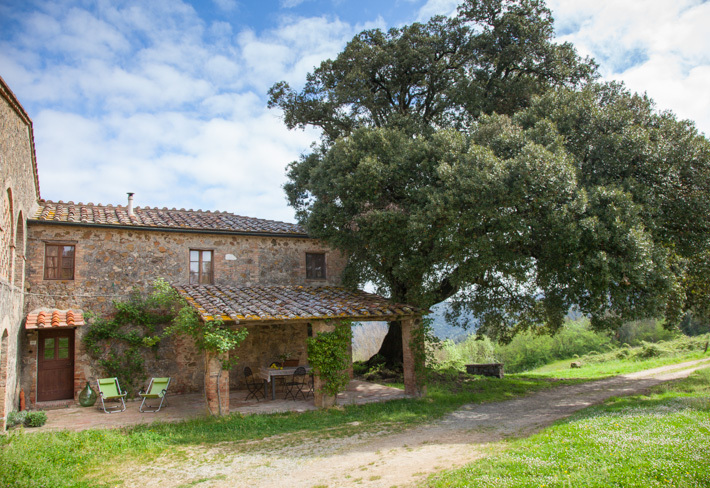 Casetta al Leccio (sleeps 4-5) gets its name from the enormous oak (leccio in Italian) tree that towers over the western corner of this little farmhouse nestled among Spannocchia’s grain fields. The lovely ancient tree provides shade in the summer and protection from wind during the early spring and late fall. Located on a hillside covered with barley and wheat, Casetta al Leccio has an amazing view of the Castello on the opposite hill, and offers a glimpse of Siena through a notch in the Montagnola Senese hills. A pergola covered with roses in the early summer provides a wonderful place to dine al fresco, with views of the grain fields, the cherry trees, and a large rosemary bush that perfumes the air. Inside, a kitchen with a pantry, the dining room, and the living room with a fireplace make up the first floor of the house. The second floor houses the bathroom, with a full tub/shower and washing machine, a bedroom with two twin beds and a view of the fields, shaded by the oak tree, and a large master bedroom with a double bed and a view towards the Elsa River valley.There is also a small room outside the master bedroom that can be used as a study or to house an additional guest, if extra space is needed. The kitchen is stocked with all the items needed to make and serve meals, and we welcome guests to order a harvest basket of organic vegetables from the Spannocchia garden or to try our own organic wine, olive oil, honey, or pasta when creating their own versions of a Tuscan dinner. Casetta al Leccio has woodstoves and a fireplace, and is available from April – October. We brought our two small children for a week and easily could have stayed much longer. It’s amazingly beautiful and peaceful. We took walks around the property to see the pigs, we did a scavenger hunt in the secret garden, we played soccer on the lawn overlooking the estate, and we had hot chocolate in front of our fireplace every night. The cost for utility usage for electricity, gas, and firewood is not included in house rental prices during mid and low seasons. We intentionally keep our basic rental rates as low as possible, allowing our guests to have responsibility for their utility usage during their stay. This is one way for us to encourage and reward good conservation of energy resources. Following is information about possible utility costs for our houses during each season. Utility usage varies from guest to guest and according to the time of year and weather conditions so keep in mind that these figures are a ranges of costs.